A post recently made me think about grieving, and healing, and reminded me of how far I’ve come, and more importantly, how I got here. Not So Mommy wrote about advice that it was “okay to be sad,just don’t stay there,” which sounds about right, doesn’t it? 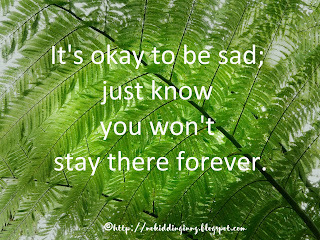 But whilst it might be true (as evidenced in Brandi's post), I don’t think it is helpful to tell someone not to "stay there” in sadness, because – whilst I recognise the temptation to do just that, when grieving becomes so familiar and almost comforting to us – when, in time, we want to move away from the sadness, we don't always know how to do that, which in turn can bring feelings of inadequacy or guilt or disbelief. With the benefit of hindsight, I think the main thing I needed to know was that it would help me to welcome joy, and gratitude. Even in the midst of grief, there were occasional fleeting moments of happiness that visited unexpectedly –the feeling of sun on my back, or a hug from a loved one, or a surprising belly laugh at something silly. I felt guilty at first (which I explore here), but they also made me realise that joy was possible. It was still okay to be sad, but feelings of happiness, or gratitude, or joy, taught me that I wouldn’t stay there forever, and many years on, I know that is true. There's a fear many have about sadness. Hence the push I've witnessed for people to move through it as fast as possible, moving on to joy. But I've learned, like you, that rushing sadness just prolongs it. Like sprinting after breaking your ankle. 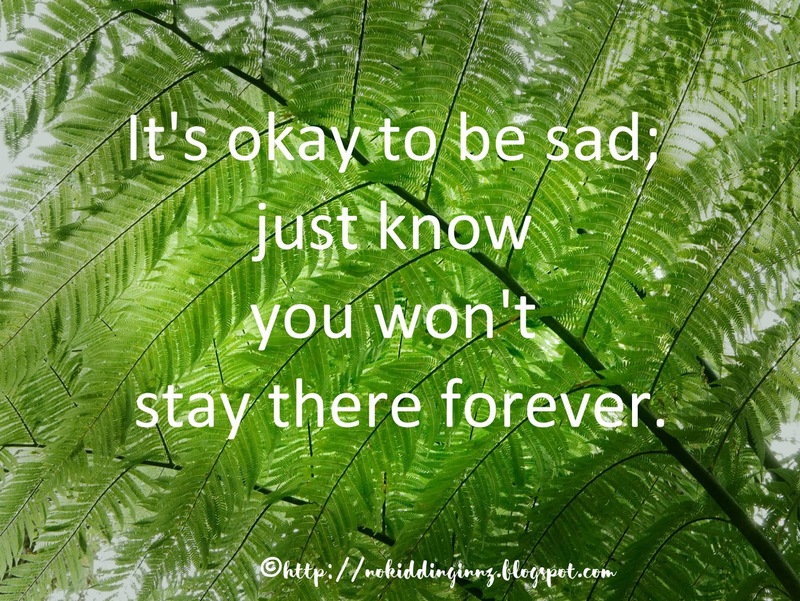 So I'm in agreement with you about being okay with sitting with sadness, knowing that its okay to feel this negative emotion as you heal from trauma. Maybe I'm still way too close to my sadness, but I have the feeling that for me, part of me will stay there forever. It's the little part that will always miss my girls, that will always be empty. The rest of me definitely isn't staying sad forever (I'm too full of snide and sarcastic to stay sad! ), and that sad part doesn't have intense pain associated with it any longer, but it's still a part of me. I think I'm ok with that, too. So maybe for me, the saying goes "it's ok to be sad, as long as you can be other things, too." Pretty much, when I think of my two lost pregnancies, I transformed from being about to think of them with pain, to thinking about them with love. Not always. But mostly. I hope you get there. Yes. Sadness seems like it's something we need to "have happen and then get over." Because of course you never want to be sad forever. But the way I see it, and from experience, that sadness never really goes away, but you find different ways of dealing with it. After almost 15 years, I can say that most of the time, the sadness has indeed gone for me. It might revisit, but it isn't a permanent companion. And I hope that gives hope. You and Cristy are very wise. I really like NotMyLines last sentence, too. I have begun to think of emotions like the element of water (flowing) rather than like earth (fixed). That has helped me open to the possibility of emotions moving through me and not staying stuck in me. This is why I really like the beautiful meme you offer here. I truly love your take on my hubby's quote and the tweak you made to it. :) Lovely post, Mali. I love this -- I think that often we aren't comfortable with sadness (our own or others') and feel the need to put on a happy face and "get over it." That causes so many problems though. I love the idea to be sad, but know that it won't last forever (the face-down-on-the-floor tile of sad at least), and the idea to be sad, but also have those other dimensions, to. To not let the sad totally define you after a bit. I needed the deep sadness that was like having all my goo out on my outside, but now I just visit that from time to time. It's such a personal thing, the sadness. But also such a relief to know it is survivable. Thank you for bringing that hope! I love your quote! And I am 100 % confirming it!